It is tempting to feel you’ve subdued nature when a hand-held device allows you to peruse newspapers from Beirut to Sydney, or purchase an airline seat that will get you to either city the next day. Fortunately — or unfortunately, depending on what we now refer to as your GPS coordinates — there are remedies for such technological conceits. When the ocean suddenly exceeds the height of your living room window, or when a thirteen thousand-ton meteorite lands at your bus stop, a dormant dread of nature is soon revived. 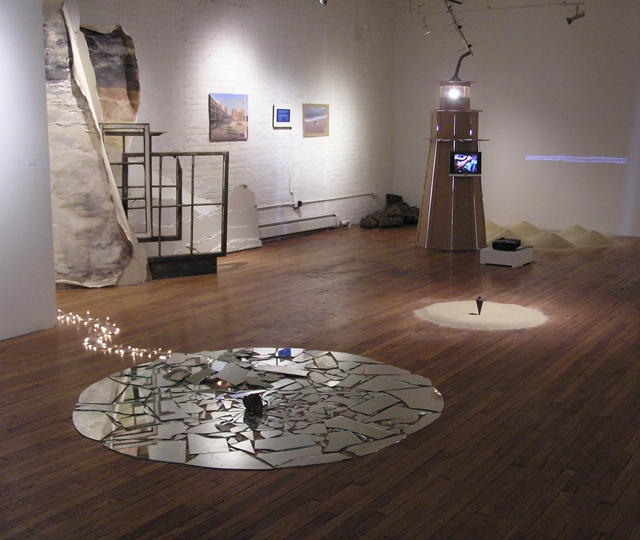 Members of Brural, a loose affiliation of artists from the Ural mountains region of Russia and from here in New York — the New York contingent being mostly Brooklynites, hence the contraction Brural — address two recent catastrophes in an exhibition at the Bronx River Arts Center’s temporary location on 140th street in Mott Haven. Brural: Shattering Phenomena, the brainchild of Irina Danilova of Project59, Inc. in New York and Svetlana Shylapnikova of the OkNo Gallery in Chelyabinsk, Russia, is the third in a series of group shows held at various locations designed to promote collaboration between artists separated only by the planet’s girth. Though there is a built-in context for a show addressing the near simultaneous cataclysms of Hurricane Sandy and the Chelyabinsk Meteorite (they were only three months apart), the diversity of response among the artists was surprising. 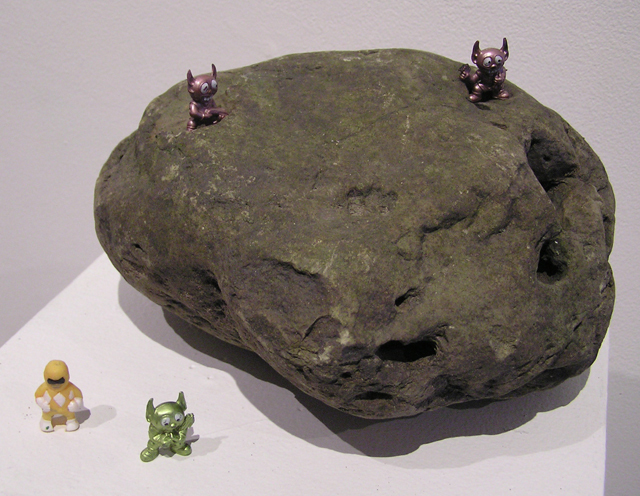 It ranges from Alexander Danilov’s constructivist inspired computer prints titled simply “15.2.2013,” to Alberto Bursztyn’s melon-sized sculpture “Bronx River Meteorite,” populated by tiny plastic spacemen. The media intensity of Vova Vishnikov’s nine minute video, “One Morning,” a montage of security camera footage intercut with eye-witness videos and news reports set to a techno soundtrack, is in sharp contrast both formally and emotionally to Ed Herman’s Sandy-inspired “In the Dust,” a brown, lumpen shape in the corner of the gallery that upon closer inspection reveals itself to be the figure of a homeless man wrapped in mud-soaked burlap, a crumpled paper cup held by an unseen hand within the mummified cloth. Brural’s spirit of cooperation is manifest in the presence of artist collectives, including Asya Dodina and Slava Polishchuk, whose charcoal drawings are framed by a crust of discarded electronic detritus, in Jeff Kasper and Sophie Cooke’s projected stop-animation film of a growing spiral, and in Vydavy Sindikat’s “Pulling Thread,” a twenty-minute video of a pair gathering a long thread from the ocean. Evidence of a general communal spirit could be detected as well in how an extension cord powering several artist’s installations ran under the sand of a third artist’s floor installation. 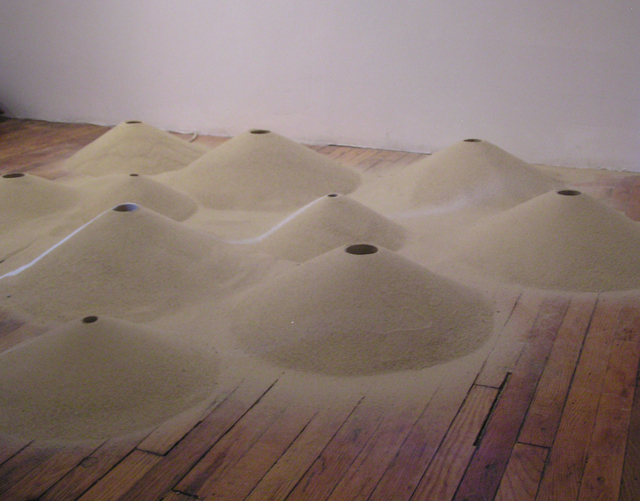 The floor piece is Irina Danilova’s “Meteorite Sandy,” a number of cone-like mounds formed by pouring sand over vertical tubes. Consolidating the image of tunnels that were burned into the snow by the meteorite’s fragmentation — making it easier to rescue people trapped below — with the oddly placed sand dunes left in the path of the hurricane pulled both events together into a single image. The awkward placement of the piece was meant to express the dislocation suffered by both populations. To its left stood Chad Stayrook’s “Siren’s Song (tuning device),” an eight-foot high lighthouse made of cardboard and plywood, with a turning beacon. For a piece made of inexpensive materials it is unusually elegant and well put together. Eric Pesso’s inverted wood carvings came from a Sandy destroyed oak tree. Judson’s laptop piece layered words and phrases taken from descriptions of either event that fade in and out while blending in with the image of the viewer captured from the laptop’s camera, though one’s image is very difficult to see. Several artists use variations on photography: Brent Wolfson-Stofko’s color print of a damaged section of Coney Island is itself covered in a thin layer of sand; Sergei Zatkov’s four photo panels use the shallow focal depth of a macro lens to capture the tiny scale of the meteorite fragments — which made for an interesting contrast to Alena Zabolatina’s sixteen photo grid piece, “Chelyabinsk Meteorite” also depicting close-ups of meteorite fragments, but with greater attention paid to the stone’s dark mass and color. Rebecca Norton’s “ffing” riffs on abstract elements suggesting fragmentary shards; Helena Schetinkina’s ink drawings are the most abstract and least literal of the show yet one of the most visually compelling. And the largest piece, Linda Cunningham’s “The Edge of Change,” is a rendering in broken drywall and actual window frames made from what was once a room in a house. Photo transfer images of wetlands cover a canvas surface that functions as a backdrop. If there is any one message that comes to the forefront after having seen an exhibition of such breadth and diversity it is that Brural illustrates how technology may not always protect us from the ravages nature may visit upon us in the future, but that same technology has apparently helped us form genuine global communities, even in places where a Cold War once kept things very local. Brural: Shattering Phenomena continues at the Bronx River Arts Center’s temporary space (305 East 140th Street, #1A, the Bronx) through March 1. Live performances marking the one-year anniversary of the Chelyabinsk Meteorite will take place February 15, 6–9pm; a panel, “Surviving Sandy,” will be held on February 28, 6–8pm.